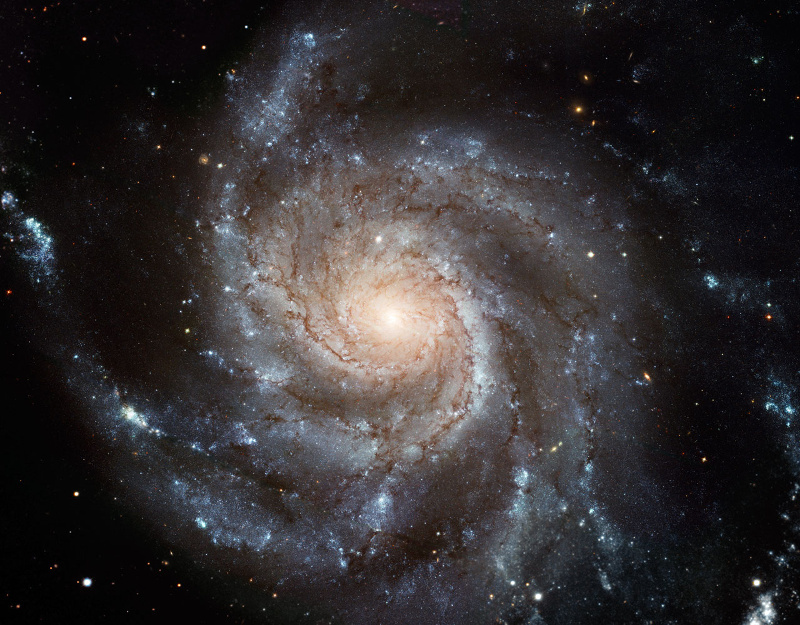 The Pinwheel Galaxy in the constellation Ursa Major (the Greater Bear) is a “grand design” spiral, meaning that it has well-defined spiral arms and dust lanes that extend all the way around the body of the galaxy. It was discovered in 1781 by astronomer Pierre Méchain, and included as object number 101 in Charles Messier’s list of celestial objects. The Pinwheel Galaxy is about twice the diameter of the Milky Way Galaxy, and is formally defined as a weakly barred spiral galaxy. There are more than 3,000 starbirth regions in the spiral arms of the Pinwheel Galaxy, the most of any similar type galaxy thus far observed. These are called HII regions, for the copious amounts of hydrogen they contain. The Pinwheel Galaxy has a fairly small central bulge, with about 3 billion solar masses. Compared to the starbirth action in the spiral arms, the bulge is very quiet, with almost no stars being born there. While many galaxies have a central supermassive black hole, astronomers have not found one at the heart of the Pinwheel Galaxy. There are many x-ray sources in the Pinwheel Galaxy. They emanate from exploded stars and regions around stellar-mass black holes (where material is heated as it falls into the black hole). The Pinwheel belongs to a group of galaxies that are all interacting with each other gravitationally. As a result of this dance, their shapes are distorted.